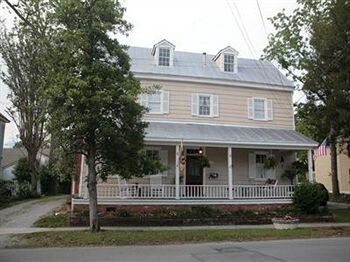 Property Location Located in New Bern, The Captain&apos;s Stay is in the historical district and minutes from Tryon Palace and New Bern Firemen&apos;s Museum. This bed & breakfast is within the vicinity of Pepsi Museum and Northwest Creek Marina.Rooms Make yourself at home in one of the 4 guestrooms featuring DVD players. Conveniences include coffee/tea makers, and irons/ironing boards can be requested.Rec, Spa, Premium Amenities Take in the views from a garden and make use of amenities such as an arcade/game room and tour/ticket assistance.Dining Mingle with other guests at a complimentary reception, held daily. A complimentary continental breakfast is included.Business, Other Amenities Free self parking is available onsite.